G7: Can It Do Anything To Stop Global Credit Crisis? G7 finance ministers (front row) and central bank governors (back row) at their last meeting in Japan. Front Row (L to R) British Chancellor of the Exchequer Alistair Darling, U.S. Treasury Secretary Henry Paulson and Luxembourg Prime Minister and chairman of the Eurogroup Jean-Claude Juncker. 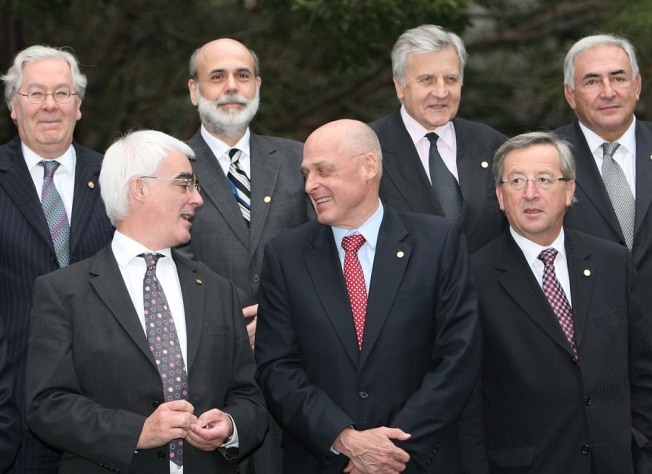 Back Row (L to R) Bank of England Governor Mervyn King, Chairman of the Federal Reserve Board (FRB) Ben Bernanke, European Central Bank President Jean-Claude Trichet and IMF Managing Director Dominique Strauss-Kahn. Global financial markets, like so many frightened children, are now looking to the G-7 to put some heat on the glacial credit freeze. Many strategists and analysts do not expect much to come from the G-7 meetings, underway in Washington tomorrow, but nonetheless markets, desperate for progress, are rife with rumors that something will happen. Clearly, coordinated interest-rate cuts by major central banks Wednesday were not enough of a fix even though they were widely anticipated and rumored panacea. So, there's now speculation making the rounds that the G-7 will guarantee all -- yes ALL -- interbank lending. The same rumor has been making the rounds specifically about the Fed. As government regulators struggle to unfreeze the markets, they have taken extraordinary steps and have shown an uncommon level of cooperation. It's everyone's problem that the global banking system is not working properly and they know it. For that reason, Brown Brothers Harriman chief currency strategist Marc Chandler thinks G-7 may concoct some plan for release this weekend even if not as drastic a step as guaranteeing interbank lending. But what it is remains to be seen. "Coordinated rate cuts stole the G-7's thunder," he said. "Market psychology is so fragile that a significant disappointment is going to be counterproductive. That's why I think they have to do something," he said. Could ministers agree to guarantee interbank lending? "I think it is possible...I don't think they'd say it until they get an agreement. It's reasonable and consistent with other steps they are taking," he said. "...The danger is, if they don't have some new agreement, people are going to say 'Why did you cut rates? That wasn't the problem." What Investors Should Buy Now: Top Strategist "Guaranteeing all interbank lending would seem to be an effective way of easing the crisis in the money markets, which is spilling over and hurting innocent bystanders, like corporations and exacerbating the downside risks to the economy. It would also require, it seems, international cooperation on a level that perhaps we haven't seen before," Chandler wrote today in a note.